Exodus: Gods and Kings is the latest biblical tale to make the jump to the big screen. I would hate to put a “spoiler alert” on a 3,000 old story. However, for those not familiar, Exodus is the second book in the bible that’s most popular for the harrowing tale of an orphan named Moses who has an encounter with God and frees his people from slavery. The entire story culminates with Moses and his people miraculously crossing the Red Sea as God uses Moses to part the waters. Director Ridley Scott sets the stage in his retelling of the Exodus tale with Moses (Christian Bale) and his brother Ramses (Joel Edgerton) thick as thieves, living like kings while slaves build monuments in the city. After talking to a slave (played by Ben Kingsley), Moses learns he’s actually a child of the Hebrew slaves. Moses is immediately banished after Ramses finds out his secret. During his exile Moses meets his wife and has a child, but more importantly he has an encounters God via a burning bush. Moses’ spiritual encounter leads him back to Memphis, Egypt – under the direction of God – to free his people from slavery. Exodus: Gods and Kings lives up the promises you see in its trailers – the sequence of plagues is awesome, the parting of the Red Sea looks spectacular on a big screen, and Christian Bale gives 110%. Unfortunately, that’s about all the movie has to offer. I’m not sure exactly when and/or where the film starts to make a hard left turn into Whatarewewatchingville, but I can point to the little kid at the burning bush. Somewhere somebody made the choice to have Moses’ encounters with God include a young child as the representation of God. A young child with a British accent. A young child who routinely looks like his mom said, “No more Xbox until your grades improve.” Maybe it’s the scene where God-kid almost has a tantrum while talking to Moses. Maybe it’s the constant snarl on the kid’s face. Maybe it’s that little kids speaking like adults is creepy. That bizarre choice to make a kid God’s representation was comically bad. So bad, it makes it hard to take any of those scenes seriously. The film gets even more bizarre with shot after shot of dead horses and a really depressing dead baby scene where it’s obvious the baby is rubber. You watch it flop around like a fish in his crying father’s arms and it looks utterly ridiculous. And yes, that scene got a few laughs in the theater. Dead babies are never funny. But Having massive budget yet trying to save money with rubber babies is hilarious. Joel Edgerton’s arc as Ramses mirrors the film in lot of ways . Ramses starts off as an interesting baddie. He’s a king-in-waiting who is paranoid that something is up with Moses but he can’t put his finger on it. It may not have been the most amazing take on Ramses, but it was interesting and entertaining. By the time the film gets halfway through the second act, Ramses is a comical bad guy who just wants the people who fail him dead. No paranoia. No faith. No hatred for God. He’s just a man with guyliner, a bald head, and an affinity for gigantic statues of himself. That’s Gods and Kings in a nutshell. It starts a little interesting but quickly turns into a gumbo of crazy choices and bloated story lines. The biggest of all the film’s problems is it being a biblical film that lacks God – and I’m not talking about British God-kid. That little guy got enough screen time. Diet Biblical Movies, as I’m now calling them, are potential blockbusters but lack everything in their stories that make biblical stories compelling – God. Think of these stories like superhero origin stories. Now imagine a superhero origin story where they never talk about where the hero gets his powers from. The Fortress of Solitude scene in 1978’s Superman is a pivotal scene. He learns who is father is, who he is, what his powers are, and what his purpose is. Gods and Kings desperately needed one of these scenes. Of all the things the film lacks, it lacks entertainment value the most. There’s no reason a film about Moses should be this boring. There isn’t one scene I can point to and say, “Even though the movie is bad (fill in the blank) scene is really good.” Not one scene. What do Aaron as Moses spokesperson, Moses’ staff, the Promise Land, and Moses killing the slave master have in common? They are interesting parts of Moses’ life story and not in this movie. In a year with a lot of very good minimalist films (Whiplash, Enemy, Boyhood), Exodus: Gods and Kings feels like a bloated waste of 150 minutes. It’s worth mentioning Exodus biblical story is actually fascinating. How Ridley Scott managed to drain it of anything entertaining is beyond me. Posted in Reviews and tagged adaptation, Ben Kingsley, bible, Christian Bale, Exodus: Gods and Kings', God, Grade: D, Joel Edgerton, RIdley Scott, Superman. Bookmark the permalink. 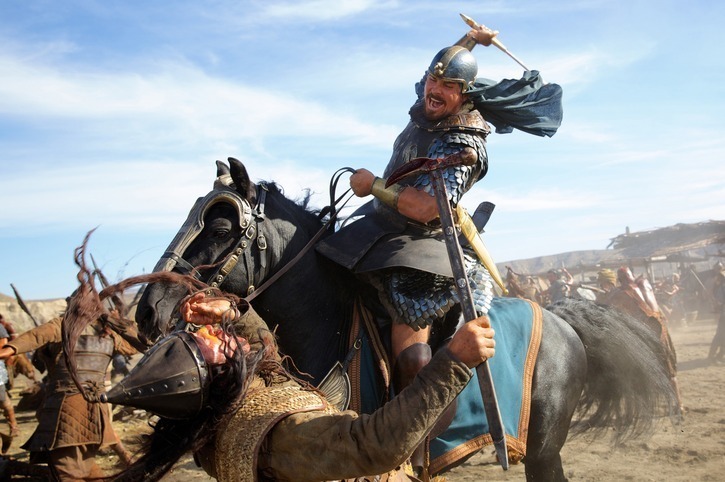 épopées historiques avec “Exodus : Gods and Kings”.